The Internet of Things is projected to infuse some $7.1 trillion of value into the global information technology economy by the year 2020. But when will it start reaping the benefits? The Internet of Things (IoT) is a goldmine waiting to happen, says a new report from management consulting firm McKinsey & Co. However, according to its findings, we may have to wait for a long time to unlock its full potential. The demand for connected devices spans multiple industries, including energy, automotive, consumer devices, healthcare and more. While smart homes may be the consumer face of this movement, the broader potential lies in other areas—like manufacturing, connected cities, healthcare and retail. The biggest opportunities lie outside some of the “flashy” consumer-level devices like wearables, thermometers and smart refrigerators. The real opportunity lie in industrial IoT. This market is set to reach $151 billion by 2020, according to, MarketsandMarkets. This brings a dramatic change to manufacturing, energy, agriculture, transportation and other industrial sectors, considerably affecting the way companies work. IIoT will evolve to encompass next generation methods and procedures such as “teleoperation” (operation of a machine at a distance), tele-robotics, and other areas that rely upon interface and control of real objects by virtual objects. The benefits of the IoT are limitless. However, there is a range of complicated factors that pose big hurdles in its full growth. Though on one side we talk about connected world, Internet is still a far cry in many areas of the world. While companies like Google are working hard to change this with its balloon-powered Internet and other low-power, low-cost ways to spread the Internet, success has been spotty to date. There aren’t many large potential customers yet. While there are roughly 10 billion sensors deployed today for natural resources, production lines, electricity grids, logistics networks, recycling, homes, offices, stores and vehicles, many are not connected to the Internet or even parts of a network. The investments needed to complete these connections won’t materialize until the revenue potential is clear. Most organizations have been slow to embrace the potential of connecting everything. More than 400 standards already exist, which is rather a good amount. The focus now should be now on building standard communication protocols for the sensors they embed into their products, rather than creating data silos with proprietary protocols. The OEM’s producing industry ready IoT devices will need to invest a lot of money and time to create standardized protocols common for all IoT devices or else it will delay product deployment across different verticals. The possibility of tracking and surveillance of people by government and private agencies increases as the devices are constantly connected to the internet. These devices collect user data without their permission, analyze them for purposes only known to the parent company. The social embrace of the IOT devices leads people to trust these devices with collection of their personal data without understanding the future implications. With so many interconnected devices out there in market and plenty more to come in the near future, a security policy cannot be an afterthought. Smart and connected devices systems and other tools can be attacked or deployed to access highly sensitive data, as scholars and others have highlighted. Also, simply flooding the frequencies of wireless networks can paralyze them. An Internet of Things is no good if the things can’t talk. By 2020, Gartner estimates that the number of smart devices would reach 25 billion by 2020, an increase of 100% each year. 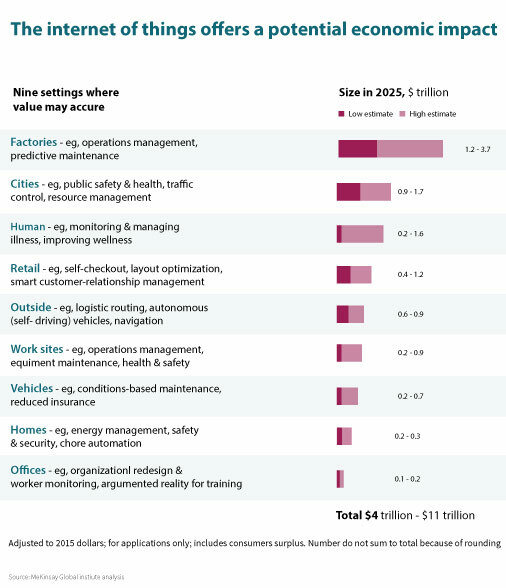 And the Internet of Things is likely to require even more. Even with improved batteries and green sources like solar and wind, just meeting the demand will be difficult. Because large deployments mean the batteries in nodes may not be rechargeable or even replaceable, we’ll probably need energy harvesting—in which systems capture and store power from ambient sources like solar or kinetic energy—to power a vast array of lower-power gadgets without batteries. However, even if the capacity is available now, there will be further demands made on storage availability. Businesses will have weigh up the economics of storage against the value of IoT information. IoT applications will require end-to-end solutions including cloud storage support. While IoT brings about new opportunities; at the same time, it adds multiple layers of complexity. Yet none of these challenges is necessarily a reason to oppose the Internet of Things. The Internet of Things is a natural extension to the capabilities the Internet of today provides. With its potential to revolutionize the way we behave with things around us, the next generation of connected devices is already starting to create an interactive interface with our lives. Ram Reddy, Chairman MosChip elected as an Executive Council Member in IESA.